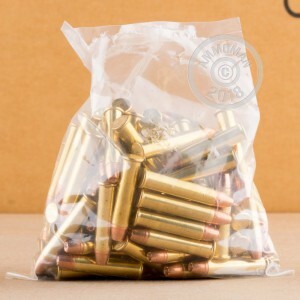 If you like to shoot and don't care about pretty packaging, grab some of our bulk mixed lots of ammunition. These cartridges are in great shape, but the boxes they came in weren't--so we're offering them to you at a reduced price. This box contains 100 cartridges of .22 Winchester Magnum Rimfire (WMR) ammunition. The cases may be brass or nickel plated and the bullets come in both solid and hollow point types with and without copper plating. While you wouldn't want to use this ammo for match shooting due to the slightly varying ballistics from round to round, it's a great choice for general target use. 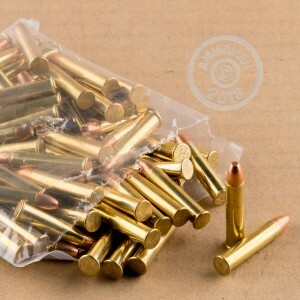 Stock up on ammunition at AmmoMan.com and enjoy free shipping if your order exceeds $99! Given the price of .22 WMR these days, this was an excellent bargain. Good mix of product with a bit of everything including some shotshells. Will buy more if it is ever available again. Thanks! I can't wait until next time someone breaks a bunch of boxes open and mixes them all together on accident so I can get more .22 WMR at a great deal. It also makes trying different brands to see what works in your gun more easy when you get several different brands in one bag! Good quality ammo. I got a selection of CCI, Hornady, Fiocchi, Armscor, and Federal. My PMR-30 says "Yum, yum, yum!" to this salad of goodies.